The Kamppi Center shopping mall in Helsinki, Finland replaced its digital signage installation with a 14.4m-high LED screen powered by Matrox Mura MPX Series video wall capture & display cards. 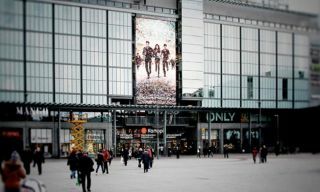 The 14.4m-high LED digital signage installation outside the Kamppi Center shopping mall in Helsinki, Finland is powered by Matrox Mura MPX Series capture & display cards. With metro and bus stations on the bottom floors, the mall, located in the Helsinki district, has a daily footfall of approximately 110,000 people. Craneworks, a local digital signage contractor, selected a 108m² Mura-powered digiLED outdoor screen that is three times the size of its predecessor. Craneworks uses a Mura MPX-4/4, four-input, four-output board, inside an HP Z600 system, to display content from various inputs, including a Mac mini media player, local DVI input, and live feed. Mura also scales and switches between content for different ad campaigns. Mura MPX Series boards can be combined within single controller systems to meet specific channel requirements and drive video walls of different sizes for various applications. Different control options are available from the Mura Network API, which helps in the development of third-party software options, to Matrox MuraControl for Windows for layout creation/switching and input management. “Our digital signage player software does basic layout and input control and we use MuraControl for Windows for remote layout management for special live event purposes,” said Vuoristo. The Kamppi Center has paid itself back in one year’s time featuring ads and social media feeds to interactive games.